Our team gave Brian a wooden frog as a gift in tribute to his book on time management called "Eat that Frog!" 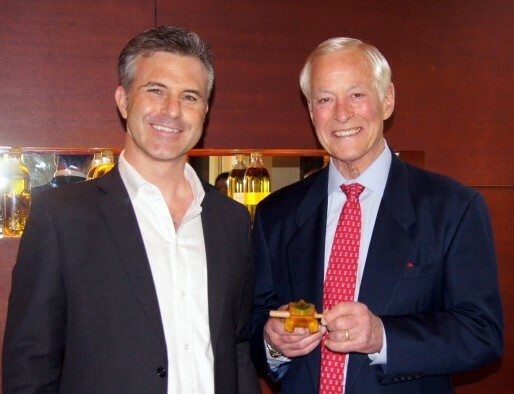 Last Thursday I met Brian Tracy during his “Double Your Productivity” workshop in Saigon. It was like meeting a rock star. Brian is my favorite business and personal improvement guru. He has a genius for communicating powerful ideas simply and effectively. He cuts through the clutter to what really matters. One of my favorite ideas from Brian is his simple and powerful technique to manage time. It’s actually not about managing time at all. Instead, it’s about constantly making sure you are prioritizing your activities to support your highest value goals. Be clear on your goals. Then ruthlessly ask yourself “What is the highest value use of my time right now?” I guarantee that you are wasting a LOT of time on activities that do not support your big goals. Eliminate or delegate those low value activities. Doing this alone will massively boost your ability to get things done. View the video below for Brian’s simple but amazingly effective lesson on prioritization. It was a pleasure to see you also Quan. Meeting people like you dedicated to being “unstoppable!” is inspiring. You introduced me to his book ‘Goals’ several years ago and I loved it. Probably give it a re-read before the New Year. Cool that you got to meet him. Check out his book “Eat that Frog!” Very simple ideas for prioritizing time and getting more done. It would be interesting that you list your favorite books/authors. I really recommend them to you if you haven’t read them already. Thanks for sharing all your business advises to Vietnamese. You are to Vietnam’s what Edwards Deming was to Japan ! Haha, thanks Mu! The comparison to Deming is very flattering. I have a long way to go to be like him. I haven’t read any of the books on your list. Looks like a good list. A list of my favorite books is a great idea for a post. Generally, I only read books that are written by people who have actual experience in what they are writing about. I do not read books written by professors or consultants — if they didn’t do it, how can they write about it?